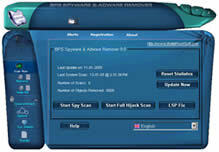 Is a multi Adware, SpyWare, Trackware, Thiefware & Big Brotherware removal utility with multi-language support. It scans your memory (for active memory ad components, which are not stored on your hard drive and last only as long as the computer is powered up), registry and hard drives for known SpyWare parasites and scum-ware components and lets you remove them safely even ad component DLLs. This tool is great if you value bandwidth, memory, & privacy, it hunts down those SpyWare programs hogging resources and causing conflictions on your computer. What's New in Version 9.2.0.4? Firewall: If you are not protected you could be a victim of hackers that could invade your equipment while you are connected to the net. The permanent connections such as DSL or the fact that you are connected to the Internet for a longer period of time make you more vulnerable. Protect your business and home information. Avoid the entrance to your equipment through backdoors that could allow the stealing of information from it, cause failures, entrance of trojan viruses or getting into your business net. The Firewall monitors the programs that try to connect to the net or wait for incoming connection then alerts the user and lets him decide whether to allow or block this connection. Anti-phishing: Phishing is the all inclusive term used to describe efforts to deceive consumers into going into a phony web site through forged or "spoofed" spam email. BPS is on the front lines of the fight against phishing, to reel in Online scammers. 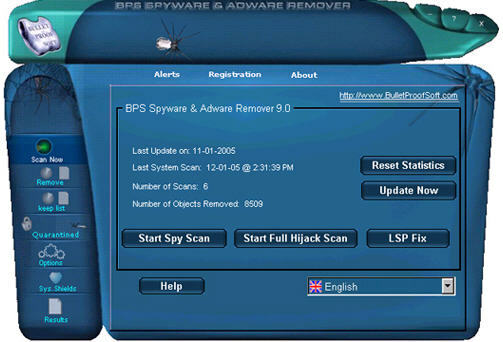 BPS spyware remover warns you when you try to connect to such type of sites, So you can protect your personal or financial information. IE home page shield that monitors any change to your IE default web page. You can now right click in a folder in your windows explorer and scan it with BPS Spyware & Adware Remover. Easy to use and navigate interface.